The numbers are in. 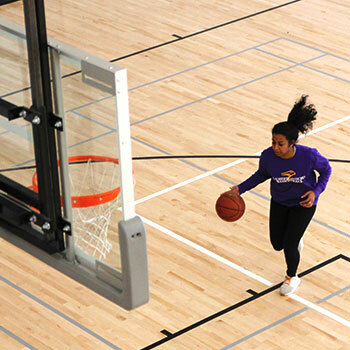 And the new Laurier Brantford YMCA has transformed how students experience recreation and athletics on Wilfrid Laurier University’s Brantford campus. In just over five months since the facility opened, more than half of Brantford campus students have used the new recreation complex. The Laurier Brantford YMCA, a partnership between Laurier and the YMCA of Hamilton | Burlington | Brantford, opened its doors to students and the community on Sept. 14, 2018. From Sept. 14 to Dec. 31, 2018, more than 4,200 people utilized the space during a total of 61,250 visits. Of those people, 1,800 were Laurier students, who accessed the Laurier Brantford YMCA more than 23,300 times. With a student population of about 3,000, more than half of Laurier Brantford campus students are using the new facility. The numbers represent an increase when compared to the number of Brantford campus students who accessed the former Wilkes House Residence Recreation Centre. During the 2017 fall term, Wilkes House was used 11,852 times, meaning the Laurier Brantford YMCA has led to a 52 per cent rise in student participation in athletics and recreation. The Laurier Brantford YMCA, which includes a single gym, double gym with seating for up to 860 people, an aquatics centre and fitness centre, has allowed Laurier Athletics to host tournaments and events in Brantford. New and existing student clubs, extramural teams and varsity teams now train and practice on campus. The addition of an aquatics centre in downtown Brantford has led to the formation of two swim clubs. There is also increased opportunity for students and community members to participate in structured fitness programming, with 52 classes offered each week, up from 40 classes that were offered with the previous partnership between Wilkes House at the Brantford Family YMCA. The addition of clubs and classes is one of the ways the Laurier Brantford YMCA has responded to community needs. The downtown Brantford facility has quickly become an important gathering place for both students and community members.